Dermapen’s advanced vertical skin needling technology uses multiple needles that vertically pierce the skin with an automatic vibrating function. When moved across the skin’s surface it stimulates collagen production, whilst allowing fine channels to be created in the skin. The channels can carry up to 80% more topical nutrients, allowing for treatment delivery deep into the skins fibroblasts to feed the underlying cells found in the dermis and basal layer. This increases absorption of active ingredients into the skin and creates stimulated repair and faster resurfacing results. Dermapen promotes scar-less healing and deposition of normal woven collagen, similar to fractional laser treatments but without the side effects, heat and downtime. It’s also more effective than most microdermabrasion’s and chemical peels. Unlike traditional skin needling rollers, the Dermapen causes less trauma and has minimal epidermal (skin) damage, therefore reducing pain and discomfort, and making it a safer more effective treatment. Dermapen is much safer and more effective in piercing the skin than traditional skin needling rollers, because of its unique vertical needling technology. It has a superior effect on collagen and elastin rejuvenation. Active ingredients like Hyaluronic Acid, are directly supplied to the deeper layers of the skin. 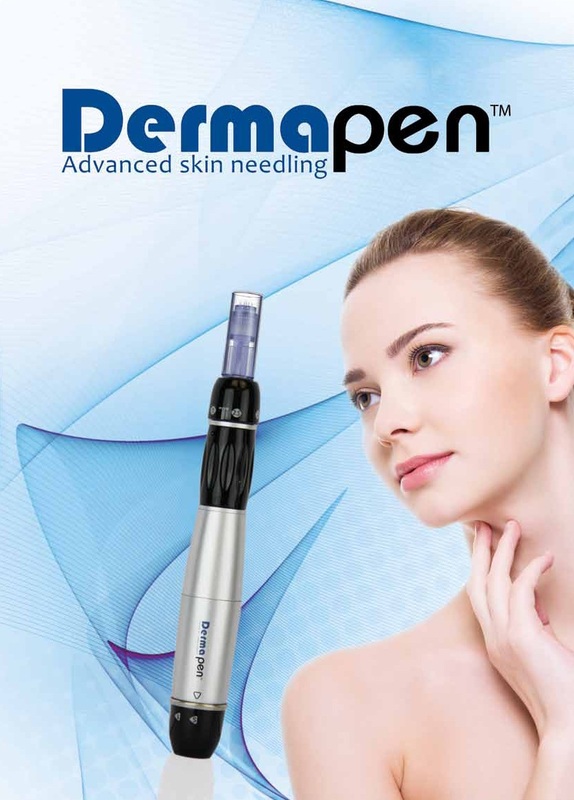 Dermapen’s multi-speed and adjustable needle depths allows the needles to pierce the skin’s layers at 90 degrees and increases the effectiveness of treatments by increasing the absorption of products. On the other hand, it reduces pain and patient downtime. Dermapen can effectively treat hard-to-reach places (e.g. around the eyes, nose, and lips). Because of the vertical delivery, the needles can easily penetrate scar tissue. 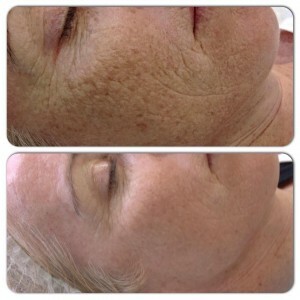 Dermapen promotes scar-less healing and natural collagen reproduction, similar to fractional laser treatments, IPL, laser resurfacing, and chemical peels, but without the side effects and downtime. The mechanism of injury is a natural process, which makes Dermapen a holistic approach to skin therapy. Four major phases of physiological wound response help in stimulating new healthy tissue growth. First, an inflammatory response (1-3 days), to the initial injury promotes the chemotaxis response and proliferation of fibroblasts (basically, a healing response). The body’s platelets also respond to initiate a wound matrix. This response is the early phase of cell migration to remove debris and bacteria and stimulate the next proliferative phase. During the second phase (3-5 days), the new fibroblasts, monocytes, keratinocytes of the first phase continue to proliferate and multiply. New collagen will be laid down and deposited with new tissue formation. Next a fibrotic response (5-20 days), of growth factors are released and fibroblasts release collagen. Finally, the maturation stage of new healthy skin takes place from day 28 to two years after treatment. Collagens mature and stiffen and the matrix of new tissue shows 80% to full tensile strength. The Dermapen fractional micro delivery provides unparalleled via fractional delivery of needles micro injuries into the epidermis and dermis. These micro injuries to the skin encourage and harness the power of the body’s innate ability to re-grow and repair the skin through the normal physiology of skin. The first phase begins with the release of the bodies growth factors and the further cascade of new epidermal growth, fibroblast chemo-taxis, fibroblast proliferation and matrix production. This proliferation of the body’s tissue continues to release growth factors from fibroblasts, keratinocytes and monocytes. The second phase of wound healing involves deposition of collagen III, IV and I, elastin, proteoglycans, and GAG’s. The last phase results in tissue remodeling where the skins vascular matrix matures and skin tightening as well as new collagen can be seen. The body’s ability to remodel and heal itself is at the heart of this amazing process. 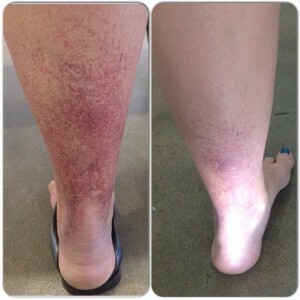 Day 1: Erythema and redness and severity will depend upon how aggressive the treatment was performed. Some swelling may be noticeable. Day 2: A red hue or pink hue persists like a moderate sunburn in some cases. Swelling may be still noticeable on the second day but very rare. Day 3: Skin can be, although rare, still pink but mostly back to a normal color. Swelling subsides. Your practitioner will prescribe Dermapen’s post procedure products & skincare after the procedure to help soothe, calm and protect the skin. Continue to use for 3 days. Active skincare can be resumed again after day 3.